Well it looks like the Mets won't be the only players (god willing) rocking Citifield this October. 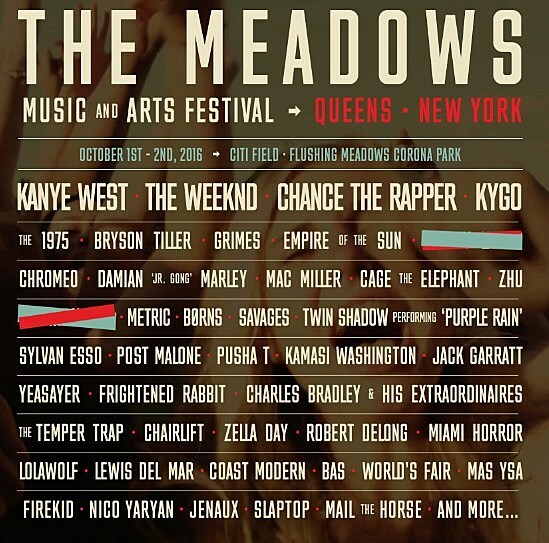 The Meadows will be a new festival thrown in Queens, right off the 7 train in Flushing Meadow Park and the Citifield parking lot. It is a pop/hip hop focused lineup with Kanye West, The Weekend and Chance The Rapper headlining. Honestly it is very underwhelming to us but a few RtBE Favs are mixed in as well with Charles Bradley and Frightened Rabbit both joining the lineup.